LotusOpening News |: Welcome to Fatville (Huntington), West Virginia, the fattest city in the U.S.A. Welcome to Fatville (Huntington), West Virginia, the fattest city in the U.S.A.
Huntington, West Virginia, is a small city nestled along the bank of the Ohio River. It has five parks, a famous college football team, dozens of churches, countless fast-food restaurants, a population of 49,000 and a mayor, Kim Wolfe, who rides a horse and delivered all of his eight children himself. 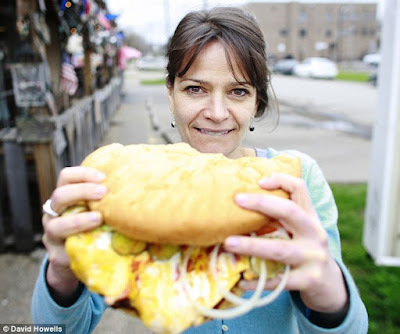 It has also been recently crowned the fattest city in the U.S., which is the developed world’s most unhealthy country. Everywhere you look in Huntington, there are oversized people — in the cinema complex, outside Starbucks, squeezing into booths at Buddy’s All American Bar-B-Que. A few are just large, but more are properly obese — bulging out in all the wrong places and too big to run, jog, ride a bike or even walk without wheezing in pain. It isn’t just grown-ups. Grossly overweight children waddle about clutching huge bags of crisps, their legs chafing at the tops and their tummies straining beneath stretched T-shirts. Huge teenagers slope about on street corners, smoking and drinking fizzy drinks from enormous containers. More shocking, though, is that no one’s staring. Not even covertly. Because fat is normal here. Almost half the population is clinically obese. Which is why Jamie Oliver chose it as the setting for his controversial new TV series, Jamie’s Food Revolution — currently causing a stir in America — in which he tackles the city’s dire eating habits by changing school meals, educating parents and setting up a ‘non-profit cooking education centre’ to teach people how to shop for and cook healthy meals. He has adopted a similar approach to Jamie’s School Dinners — the 2006 UK series, which saw furious Rotherham mums delivering burgers and chips to their children through the school fence after he replaced Turkey Twizzlers and chicken dinosaurs with Mexican bean wraps and salad. But if things were tough in Rotherham, they were much worse in America. When he turned up last October, many of Huntington’s six-year-olds were unable to identify a tomato. Or a potato, a cauliflower, a pea, a carrot, an aubergine, a beetroot or even an onion. They weren’t stupid — they’d just never seen fresh vegetables. They had been brought up on a diet of chicken nuggets, hamburgers, hotdogs, chips and pizza (schools even served pizza for breakfast). Some children didn’t know that chips came from potatoes. And while from the off some residents hailed Oliver as ‘St Jamie — sent from God’, the welcome wasn’t entirely warm, with locals already smarting at their new ‘fattest city’ status, courtesy of the U.S. Centers for Disease Control. *For Huntington's best source for health and wellness for the past 20 years, visit and become a Fan of New Earth Resource Company on Facebook.